This week’s earthquake was a natural disaster, totally unexpected by everyone except for professional seismologists. Of all the causes of Haiti’s suffering, only the earthquake itself does not have human fingerprints on it. Haiti was once a fertile island paradise (well, half an island: it shares the land mass with Dominica). The French colonized the western half of the island of Hispaniola. The indigenous population was quickly destroyed by exposure to influenza and other infections brought by the Europeans. They were soon replaced by slaves kidnapped from Africa. The French fed their country with food grown on Haiti’s rich soil. The French and the corrupt rulers who followed them over-exploited the land and destroyed its fertility. There are few trees left on Haiti–there are a few-oranges, grapefruits, avocados, mangoes–they are sweet but rare. A few people make a living selling their fruit. But there are not enough trees left to prevent erosion, which makes flooding and other natural disasters worse. I visited Haiti 20 years ago, and I don’t recall seeing a bird. I do remember seeing the local Haitians recycle used motor oil–they poured it on any pools of standing water to kill mosquitoes. In 1804 Haiti became the second nation in the Western hemisphere to declare its independence. In a glorious revolution that should have made the French proud, they killed every white person on the island. Tragically, since gaining a form of autonomy, Haiti has been ruled by its own dictators and corrupt leaders. The notorious Duvaliers used the fear of voodoo along with old-fashioned terror and brutality to keep its citizens from enjoying the fruits of freedom. You are beautiful, you are a child of God. Hold your head up, God loves you. There are, of course, many people working with non-governmental aid agencies that are not religiously affiliated. Usually the missionaries and “secular” aid workers respect each other and work side by side. They are all there to help the people of Haiti. One mission trying to help the land of Haiti with long-term recovery is “Eden Reforestation Projects.” Two missionaries from the Free Methodist Church working with Eden Reforestation are reported in critical condition, and three are missing, after the earthquake, according to our local Eden Vigil representative Lowell Bliss. I’ll have more later, but right now I want to encourage anyone who can to donate to relief efforts in Haiti. There are many organizations and groups already there on the ground ready to distribute aid. The needs in Haiti were enormous before the earthquake; but every drop in the bucket helps someone. The Mennonites have been doing a lot of good work for the poor in Haiti, as they do around the world. They are well respected by the Hatian people and have the infrastructure in place to distribute aid. (Mennonite Central Committee). World Vision also has a good record of service in Haiti. If you have another favorite organization, by all means contribute there. 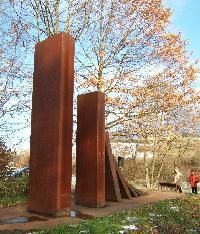 In 2005 a memorial was erected in Ulm, Germany, to German soldiers who deserted the Nazi cause during WWII. What do you think, did they do the right thing? Is it right to honor them? During WWII the Nazis executed over 15,000 deserters. Stalin’s army executed 158,000 of their own for the same reason. The United States executed one, private Eddie Slovik (played by Martin Sheen in the 1974 movie “The Execution of Private Slovik”). During the civil war deserters were executed when they could be caught (as portrayed in the book and movie “Cold Mountain). Still, over 100,000 from each side deserted. We are far enough into the 21st century now to look back at the last century. I think we have almost seen the end of two strange habits from that dreadful century. The first is smoking. Maybe 2009 was the year the nation kicked the habit. Many trends start on the east and west coasts, and Topeka, Kansas is one of the last places to catch on. But last year Topeka instituted a smoking ban. Two things amaze me. The first is how easy it was to quit. There were a few wheezing whiners who lamented the loss of their constitutional right to light up, but mostly smoking bans were accepted without a cough. Two years ago I was in Europe and they had also accepted smoking bans with very little protest. Who would have thought that the tobacco lobby would lose their grip on the political process–after years of funding maverick scientists who denied the link between smoking and death? Who could have imagined that senators from Virginia and North Carolina would give up the battle for their traditional way of life? It is almost a miracle that we as a nation kicked the butts of the tobacco industry. The other thing that is amazing to me from my vantage point now is how ubiquitous cigarettes were. When I was a child every TV talkshow host punctuated conversations with a cigarette. Chivalry demanded that a gentleman offer a light to a lady. We kids knew all the jingles of the cigarette companies. Our parents bought us candy cigarettes–the same way parents buy toy guns for their kids today–harmless fun. For school crafts or shop class projects, we made ashtrays for our parents. When I was in high school we knew we would be treated like adults when we went to the local community college, because they had a smoking lounge. Cigarettes were fashion accessories. Never in the history of free enterprise has their been such a successful marketing campaign! Of course the tobacco companies had a big advantage–their product was highly addictive. Malcolm X said he was convinced tobacco was as addictive as heroin. The same scientists who publicly denied the harmful effects of cigarettes were carefully manipulating the nicotine levels to keep their subjects hooked. But there were other scientists who were studying the effect of nicotine on the brain–and they have found ways to break the chains of the addiction. There is plenty of help out there for those who are ready to quit (here is one example.) I advise young people who smoke: You will quit someday, when your doctor puts you on oxygen and tells you you will blow up if you light up. And it won’t be any easier to quit then. You might as well quit now and enjoy the benefits. 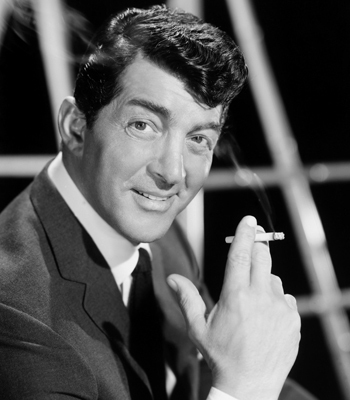 The photo of Dean Martin above is one of “5 Celebrities” with lung disease. The distinction of being the youngest of the celebrities with self-inflicted emphysema is Amy Winehouse, who was diagnosed at the age of 24. You know, I really hate cigarettes.